In the heart of Virginia's Tidewater region, Old Dominion University is a state-run institution with a global, if not universal, charter. The school, renowned for its programs in engineering and science, is a research hub for the Navy and NASA, among other agencies. It recently took delivery of a Sun Microsystems Enterprise 10000 supercomputer, which with 32 processors and 32G of memory is it at No. 350 on the list of the world's 500 most powerful computers. But until recently, the school, whose athletic teams have a lion as their mascot, was barely able to roar with its Unix systems because of a decentralized structure that had become a nightmare for its small staff, said Rowland Harrison, assistant director for Unix and system security in the school's Office of Computing and Communications Services. After confronting that situation, Harrison and his team decided to make some changes. The task started at ground level. 'We had to develop a file system that could service a large number of people and scale very well. We have been very pleased with the SunSoft Solaris hardware, and we like their Fibre Channel input/output, but we also very much like the IBM Serial Systems Architecture,' Harrison said. Vicom Systems' SLIC Fibre Channel storage routers helped Old Dominion University create an architecture that meets the needs of researchers and graduate students. 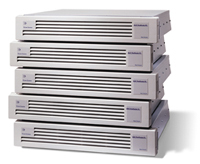 Those routers are part of Vicom Systems Inc.'s SLIC storage area network products, an acronym for Serial Loop IntraConnect, which implements Fibre Channel Arbitrated Loop switched storage, SSA, SCSI and American National Standards Institute standards. The product is compatible with all Unix and Microsoft Windows NT platforms, and compliant with all existing peripheral connectivity standards, Vicom officials said. Centralizing the various departmental Unix servers into a single network is helped by the addition of the Sun Enterprise 10000 and by the imperatives that an information technology department can impose. But underlying the migration is the sheer power that users will be able to enjoy, Harrison said. Finding a data storage solution to undergird the university's new network, dubbed Large Integrated Online Network Services, or LION, was vital, Harrison said. Competing products were too expensive or imposed unnecessary systems overhead, he said.